“Movin’ To the Beat!" will get you on your feet and you'll have fun doing it! Identical triplets, Mandy, Missy and Erin Maynard show off their talents on their first album. A CD with 13 original and nostalgic songs written after September 11th. 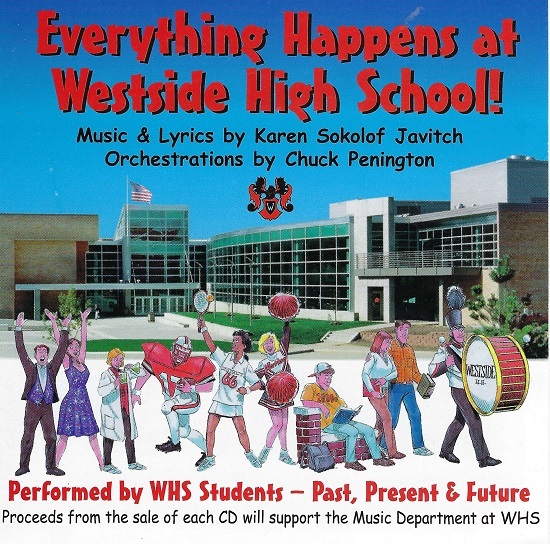 A fun high school CD! Karen has created a lively album of Jewish holiday and lifecycle songs that are perfect for school musical productions. Songs dedicated to celebrities Michael Jackson, Kardiashians, Patrick Swayze, and more. Benefit CD for the Nebraska Foundation for Visually Impaired Children. Romantic and fun songs for 2 men getting married. Romantic and fun songs for 2 women getting married. For Ages 5 to 105. Fourteen of Karen's original songs which will make you laugh, sing and rock out! All ages will love these catchy and fun songs written by this award-winning songwriter. Fun Math Songs for Grades 1-6.